356 mm/52 Model 19134 х 3 pcs. 100 mm/50 Minisini gun6 х 2 pcs. 130 mm/55 Model 191310 х 1 pcs. 12.7 mm DShK10 х 1 pcs. 45 mm 21-K20 х 1 pcs. Izmail — Soviet Tier VI battleship. A battle cruiser which, at the time of her laying down, claimed to be the world's most powerful warship. 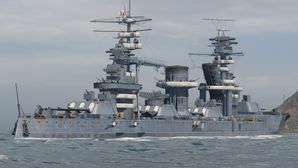 She was very similar to battleship Gangut in terms of her layout and armor type, but differed in her larger size, speed and 356 mm main battery guns. The Borodino-class battlecruisers (Russian: Линейные крейсера типа «Измаил») were a group of four battlecruisers ordered by the Imperial Russian Navy before World War I. Also referred to as the Izmail class, they were laid down in late 1912 at Saint Petersburg for service with the Baltic Fleet. Construction of the ships was delayed by a lack of capacity among domestic factories and the need to order some components from abroad. The start of World War I slowed their construction still further, as the imported components were often not delivered and domestic production was diverted into areas more immediately useful for the war effort. Three of the four ships were launched in 1915 and the fourth in 1916. Work on the gun turrets lagged, and it became evident that Russian industry would not be able to complete the ships during the war. The Russian Revolution of 1917 halted all work on the ships, which was never resumed. Although some consideration was given to finishing the hulls that were nearest to completion, they were all eventually sold for scrap by the Soviet Union. The Soviet Navy proposed to convert Izmail, the ship closest to completion, to an aircraft carrier in 1925, but the plan was cancelled after political maneuvering by the Red Army led to funding not being available. This page was last modified on 25 March 2019, at 05:46.